“A nice thick Hylauronic Acid creme that plumps up and enhances the skin. Apply a thick layer to your skin AT NIGHT and wake up to plump youthful skin.” French skincare product formulations usually revolve around one ingredient. For example: AHA’s, Retinol, Vitamin C or Hyaluronic Acid in this instance. Highly touted for its ability to hydrate and plump the skin. We have our experiences with Hyaluronic acid from infamous products such as Hydraluron, Estee Lauder Advanced Night Repair etc. Personally I keep this as an emergency hydration cream and layer it on top of Hydraluron or any other hydration serum. 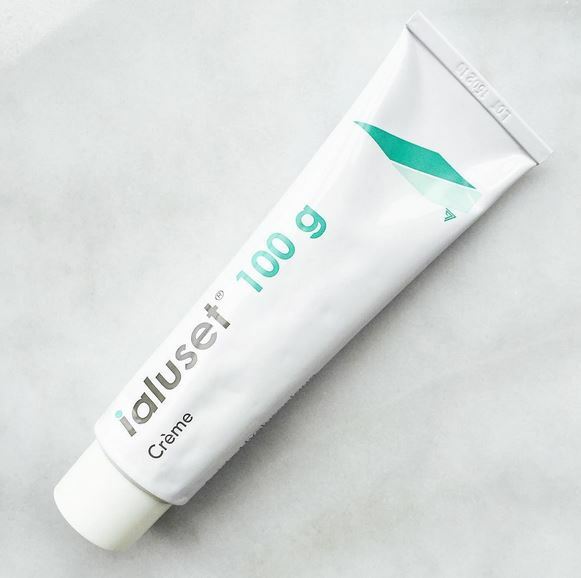 It comes in a tube (100gm) for 10-15 euros. I don’t think it is available outside France, unless there are some online options (Amazon or Ebay – verify the authenticity). In terms of ingredients, it contains 0.2% Hyaluronic Acid listed as first ingredient followed by some fatty alcohol (aka good alcohol) and humectants such as Glycerin. This is NOT paraben free (in case it bothers you). Oddly enough I noticed Sodium Lauryl Sulfate on the list (4th ingredient) not sure why this is included but thankfully it hasn’t irritated my skin.